Rogers vs Bell vs Telus: Which 4G LTE new iPad should Canadians get? Provided you've settled on color and storage capacity, In the U.S., you've only got two choices if you're hunting for an LTE-enabled new iPad. In Canada, things are a bit more complicated. During Apple's event yesterday, Rogers, Bell, and TELUS, the big three service providers up here in Canada, featured prominently. Two LTE models would be launched to make sure every able carrier would be able to offer LTE, though there's lots of 3G compatibility for elsewhere, too. The new iPad lands in Canada on March 16, and no doubt many are wondering which carrier they should go with for data service. We've chewed through the plans and coverage, and have a fairly definitive answer. There are two caveats, mind you. For one, we don't have a lot of data on speed comparisons. You'll want to ask around to see who's offering better speeds in your area. Secondly, we're assuming that The Big Three won't be switching up their iPad plans before launch day, which is entirely possible. The new iPad is big enough that there could be promotions across the board, so make sure to double-check before committing. In Canada, those LTE centres are still fairly limited, which actually makes your pick of carriers for the new iPad a lot easier. 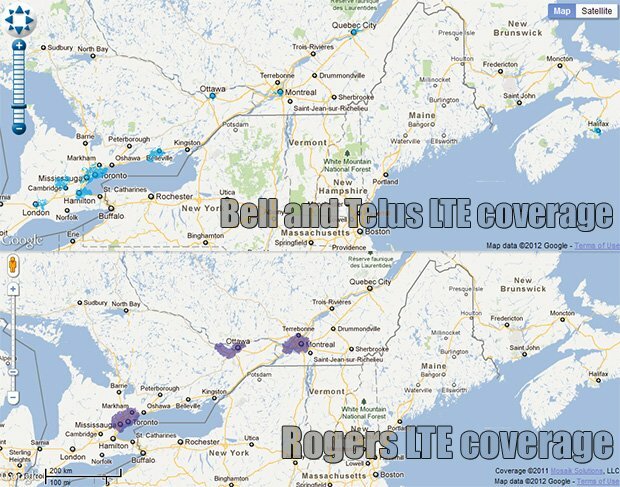 Bell and TELUS share their LTE network, so coverage will be fairly interchangable between them. They've got LTE in Toronto and the surrounding area, Vancouver, Montreal, Ottawa, Calgary, Edmonton, Halifax, Yellowknife, Quebec City, and smaller regions like Belleville, Cambridge, Waterloo, Guelph, Hamilton, Dartmouth and London. By comparison, Rogers only covers Toronto, Vancouver, Montreal and Ottawa. Rogers did recently expand to St. John's, Newfoundland, and they're expecting to cover Halifax in the next couple of months, but on the whole, Bell and TELUS have a distinct edge on coverage. It's also worth noting that Bell and TELUS are supporting dual-cell HSPA+, which means you might still be able to get up to 42 Mbps outside of LTE areas. What about pricing? This is where things diverage a little bit. Bell's flex plan starts at $5/month for 10 MB, which gets bumped up to $15/month for 250 MB if you go over, which is in turn bumped to $35/month for 5 GB, and then charging $0.15/MB after that. TELUS has a similar structure, but has two additional tiers - $10 for 100 MB, and $20 for 500 MB. That's way better, considering it's a steep change from paying $15 and $35 on any given month. TELUS also has static plans available that aren't on Bell. For $35/month, you can get 2 GB, and for $60/month, you can get 6 GB. Why would you get these instead of Flex plans? I have no idea. TELUS also lets you split your smartphone data bucket with your iPad for free if you're already a customer, which is a pretty sweet deal, considering Bell charges $10/month for the privilege. Rogers offers similar fixed and flex plans. For $15/month, you get 250 MB, and for $35/month, you get 5 GB, which is way better than TELUS's stand-alone static tablet plans. The Flex plans for Rogers iPads are a little weird, since they've kindly bundled in all of the taxes in with the fees; I guess they're worried about getting dinged by the CRTC for misleading prices like Bell did in June. For $6.93/month, you get 10 MB, which is bumped up to $16.93/month for up to 250 MB if you go over, $21.93/month for 500 MB after that, and $36.93 for 5 GB and $0.02/MB after that. 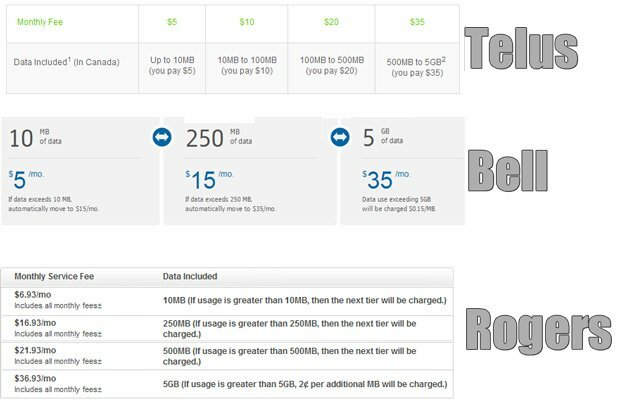 So the flex pricing on Rogers is pretty much identical to TELUS, except for the different $10 tier has been bumped up to $25 for a bit more data. Rogers also offers shareable data add-ons for smartphones that are separate from their usual offerings (though no more expensive); you get 1 GB across both devices for $30/month, 3 GB for $45/month, and $60/month for 6 GB. The sneaky part here is that it looks like you wouldn't be able to access LTE if you opt for the bottom-tier plan, which is downright dirty. Bell and TELUS don't mention anything about this, so I can only hope that they aren't doing anything similar. With all of that said, I would have to side with TELUS if I was buying one of the new iPads with LTE. They've got the broadest national coverage, the best spread in flex rates, and free sharing of data with smartphones. Obviously, if you're in St. John's, you'll pretty much be forced to go with Rogers, but for everyone else in Canada, it should be a pretty clear decision.